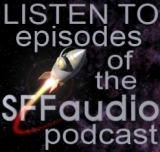 The SFFaudio Podcast #394 –Jesse talks with the great Wayne June, the narrator of Darkest Dungeon and several H.P. Lovecraft audiobooks. Wayne grew up reading science fiction and has both a love and appreciation for H.P. Lovecraft and Edgar Allan Poe. So, happier than I had ever dared hoped to be, I dissolved again into that native infinity of crystal oblivion from which the daemon Life had called me for one brief and desolate hour. I have always believed that such strange, inaccessible worlds exist at our very elbows, and now I believe I have found a way to break down the barriers. I am not joking. Within twenty-four hours that machine near the table will generate waves acting on unrecognised sense-organs that exist in us as atrophied or rudimentary vestiges. Those waves will open up to us many vistas unknown to man, and several unknown to anything we consider organic life. We shall see that at which dogs howl in the dark, and that at which cats prick up their ears after midnight. We shall see these things, and other things which no breathing creature has yet seen. We shall overleap time, space, and dimensions, and without bodily motion peer to the bottom of creation. not just horror, science fiction as well, Lovecraft is the H.G. Wells of weird fiction, the project to get Wayne June to record every H.P. Lovecraft story, packaged in the Necronomicon, slow treading, at the bottom of this ravine of problematic depth,The Call Of Cthulhu, Frankenstein, bringing our own prejudices, whose argument is this?, The Dunwich Horror is a family tragedy, coming from a dimension where aesthetics are different, Jesus and Mary, he has to break into the library to read a book, biased and racist, Wilbur wanted to learn skillz, transparent attic brother, he wanted to help his disabled brother, The Shadow Over Innsmouth, a family reunion, living forever under the sea, fishy eyes, he gets his sealegs, aquatic family values, The Tomb, Jervas Dudley likes walks in the woods, the ancestors, reverting to type, atavism, an “evil” ancestor, coming to terms with what’s in your family tree, goth or emo, who’s he hurting?, such a libertarian, let the living lie with the dead, the ending of Annabelle Lee, sleeping with a corpse, a beautiful beautiful poem about a disgusting activity, he could probably find better ways to spend his time, discernment, eating mushrooms, when we get together for pizza, Wayne June owes Jesse a pizza.